^ "Exploration Ground Systems". NASA. Retrieved 13 October 2018. ^ Garcia, Mark (2015-04-12). "Orion Overview". NASA. Retrieved 2017-01-17. ^ "Orion Explained: NASA's Multi-Purpose Crew Vehicle (Infographic)". Space.com. Retrieved 2017-01-17. 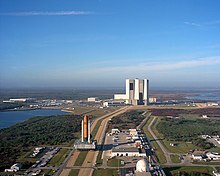 ^ "Kennedy Space Center Central Campus". NASA. Retrieved 3 February 2016. 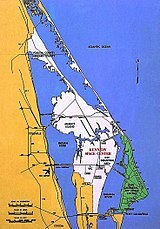 ^ "Central Campus of the Kennedy Space Center" (PDF). Kennedy Space Center Fact Sheets. NASA. Retrieved 3 February 2016. 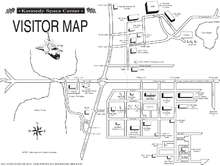 ^ "The NASA Railroad" (PDF). Kennedy Space Center Fact Sheets. NASA. Retrieved 3 February 2016. ^ "Payload Hazardous Servicing Facility". 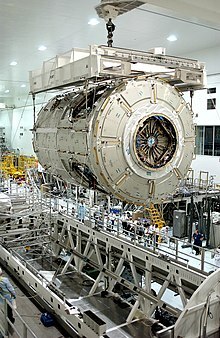 Science.ksc.nasa.gov. Retrieved 2018-05-02. 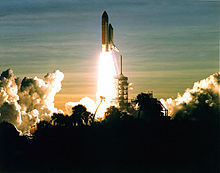 ^ "NASA Checks Shuttle After Lightning Strike Near Launch Pad". Space.com. Retrieved 2017-10-19. ^ Sangalang, Jennifer (19 January 2018). "Hey, girl: Casting call for Ryan Gosling movie 'First Man' at Kennedy Space Center". Florida Today. USA Today Network. Retrieved 30 January 2018. ^ "Armageddon Production Notes". Michael Bay. Retrieved 30 January 2018.